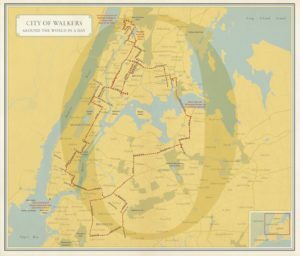 This week we’re taking another look at Rebecca Solnit and Joshua Jelly-Schapiro’s Nonstop Metropolis: A New York City Atlas with editor-at-large Garnette Cadogan‘s “City of Walkers” map and essay. Check in next week for more Nonstop Metropolis sneak peeks. We are incredibly lucky to have multiple essays by Garnette Cadogan in Nonstop Metropolis. His essay “Walking While Black,” in which he writes about his experiences walking the streets in his Jamaica, New Orleans, and New York City, appeared on Lithub earlier this summer, and continues to resonate widely, in light of the discussion plus realities around ongoing excessive use of force by police towards African American males. It was widely discussed across the internet and media, including PRI, CBC, and In These Times. A version of the essay, “Black and Blue,” appears in the recently released The Fire This Time, edited by Jesmyn Ward. Garnette’s essay in The Fire This Time has received a lot of media attention, including a rave review in the New York Times, as well as a feature in Vice and a panel discussion on The Diane Rehm Show. His essay in Nonstop Metropolis builds on the theme of walking, as Garnette walks for twenty-four hours through all five boroughs of New York City. We’re pleased to be sharing the map, along with an except of the essay below. One spring afternoon in 2015 I decided to “visit the world in a day” by walking for twenty-four hours through all five boroughs. Though the idea had the whiff of gimmickry, I thought that it would be a good exercise to have the exhaustibility of the body meet the inexhaustibility of the city. I wanted my body to be aware of its limitations (in energy, that is; I’m regularly made aware of the lines of trespass drawn because of my complexion and have inculcated rules for “walking while black”). Moreover, I thought it’d be fun to walk in a circle around New York to see what it would throw at me—my route was both planned enough and arbitrary enough to make serendipity and vulnerability meet. I began near the northwest tip of the Bronx, in Riverdale, walking past its kosher delis and Jewish schools; to neighboring Kingsbridge, with its Irish and Dominican population; over to Arthur Avenue, where the Bronx’s Little Italy overflows with Italian American families enjoying culinary delights; across to the Grand Concourse, a thoroughfare modeled on the Champs-Élysées, where the sound of bomba greets me along with its Puerto Rican residents; along to the energetic crossroads in the South Bronx known as the Hub, nicknamed the Times Square of the Bronx, with African and Latino shoppers pouring in and out of the commercial centers; down to Le Petit Sénégal, a stretch on 116th Street in West Harlem where West Africans beckon passerby into shops and restaurants with inviting colors and smells and laughter. 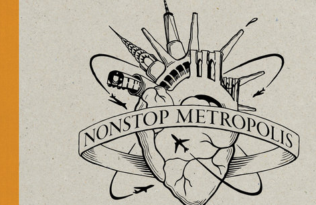 You can pre-order Nonstop Metropolis: A New York City Atlas today. Garnette Cadogan is an essayist and journalist who focuses on history, culture, and the arts. He is editor-at-large for Non-Stop Metropolis: A New York City Atlas, edited by Rebecca Solnit and Joshua Jelly-Schapiro.